I used my own money to buy this book as a treat for myself. Acknowledgments: this was such a fun book to write! Of course it is always fun when you get to work with great people and I want to take a moment to thank some of them right now. Thanks to my buddy Ruth, for all the great insight and encouragement. Huge thanks to Susan Wiggs, Elsa Watson, and Anjali Banerjee, for keeping an eagle eye on my work in progress most of all, thanks to my fabulous agent, Paige Wheeler, and my amazing editor, Rose Hilliard, and all the super people at st Martin's press, who worked so hard to help this story become a book may you all see your dreams come true this christmas. This book has 176 pages and 18 chapters in it. I would tell people that you should step outside your comfort zone with books because it is good to add more authors and genres to your reading portfolio even if you do not like books like this. I normally read books of this genre but l also stepped outside my comfort zone l am so glad l did because l have read so many great books and come across some great authors. Synopsis: when Kiley Gray discovers a snow globe in an antique shop, she has no idea how much her life is about to change. For years, the snow globe has passed from generation to generation, somehow always landing in the hands of a person in special need of christmas miracle, this year, all Kiley wants for christmas is someone to love. A hopeful shake leads her on an adventure that makes a believer out of her when Kiley shares her story of the snow globe with her best friends – two women with problems of their own – they do not believe it. But they are about to discover that at christmas time, sometimes the impossible becomes possible and miracles really do come true. Review By Other Author: Shelia Roberts makes me laugh. I read her books and come away inspired, hopeful and happy;. - Debbie Macomber. perfect for fans of Debbie Macomber, Jill Shalvis and Nora Roberts, this is a gentle, romantic christmas story that is sure to capture your heart and leave you with a smile. Review: I found this book really easy to get in to and harder to put down once l started reading it. I was hooked on this book after reading the first page. I can not put in to words how great this book is. I would tell people to read it for themselves to know how great it really is. I love how christmassy this book is. This book is perfect to read at christmas time or even winter but l would read christmas books all year because christmas is my favorite holiday.when l was reading this book l would put some essential oils in my humidifier and put the lights on my humidifier and chill on my bed listening to magic, spotify or something on television or netflix. I sometimes light a candle when l am reading this book. It is good to chill reading a good book when you are not well or in pain. I reviewed this book on goodreads, my blog, amazon UK and US and l also took a picture of this book and shared it on Instagram that l made just for pictures of my books. It is called donnareviewsbooks. I was sad to read that Otto's wife and baby passed away I was happy to read that somebody give him a snow globe because it had an angel in that looked like his late wife and he could pass it down through generations. It was really good to read that Otto found a new wife and their had a new baby. I was sad to read that Kiley's sister and fiancee cheated on poor Kiley it must be horrible going to family dinners and parties and seeing the guy that cheated on you with her sister. I was happy to read that Kiley found the snow globe because it sounds like she needs a christmas miracle, l like that Kiley got a cat to keep her company. It was nice that Kiley met Craig because she deserves happiness after what she has been through. It was really nice that Kiley give Suzanne the snow globe but it was sad that Bryn tried to get it off the fireplace and ended up falling but glad Suzanne catched her but l was sad to read that Suzanne broke her leg and ended up on clutches. Suzanne should get Bryn the dog she wants and l hope Suzanne does not break the snow globe l hope she passes it on to Alison or back to Kiley. I would happily read this book again and again. It did not take me long to read this book. I wish l had the snow globe because it sounds beautiful and everybody needs a christmas miracle. I was happy that Suzanne got Bryn a dog it was a shame she did not get happy. It was nice if Alison to go visit the old folks home and give out cookies. I was really happy Kiley and Craig got engaged and Suzanne was going to have another baby. It was great to read Kiley, Suzanne and Alison went to meet the last of Otto's family and Alison had seen the lady's living room and the lady and herself having a cup og tea together in the snow globe. It was great that the three best friends left the snow globe on the boat with a note saying if you need a christmas miracle please take it. I think they should of put on the note when you had your christmas miracle please pass it on to somebody else. About the author: Shelia Roberts lives on a lake in the pacific northwest. She's happily married and has three children. She has been writing since 1989, but she did lots of things before settling in to her writing career, including owning a singing telegram company and playing in a band. Her band days are over, but she still enjoys writing songs. Shelia's books are best sellers and often appear as reader's digest condensed books. Her novel “ angel lane” was named one of amazon's top ten romances in 2009. her novel “ on strike for christmas” was a lifetime network movie and her novel “ nine lives of christmas” is now a hallmark movie. When she is not speaking to women's groups or at conferences or hanging out with her girlfriends she can be found writing about those things near and dear to women's hearts: family, friends, and chocolate. 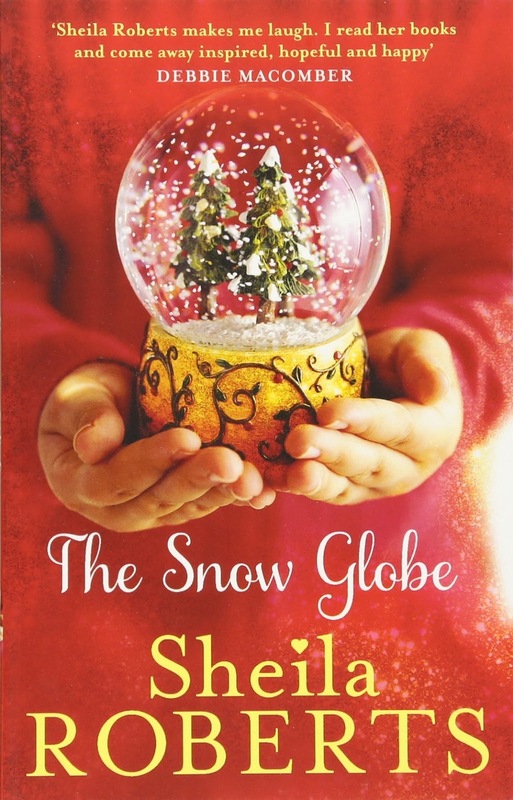 About the book: the bookcover is very christmassy and l like the picture of the snow globe and l like that the writing is yellow and white because it makes it stand out more. I wish l could rate this book more than the five stars because it is worth more then the five stars l rated it.